Wally called in at 9 PM on Aconcagua to report that after a long, challenging, and wet day, the whole team has arrived at Plaza de Mulas Base Camp. He reported that the group experienced heavy rain last night at Confluencia Camp until about mid-night. They were unsure at the time whether they would get the chance to trek to base camp. But they were certainly happy with their decision to continue on to their next camp today. 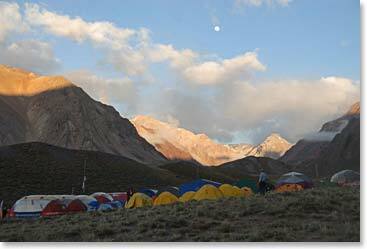 The group had clear weather in the morning which was great as they began their hike to base camp. That was followed by a heavy rain, then hail and eventually the team was hiking through the snow. Wally described that the conditions were challenging but the group performed well during their long days hike. 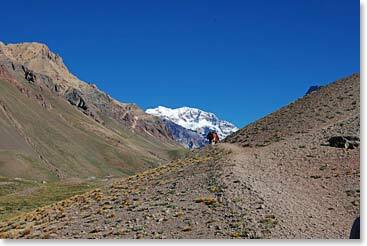 With the group split up around mid-day the average hike times were from 9 ½ to 10 ½ hours to reach their Plaza de Mulas Base Camp. 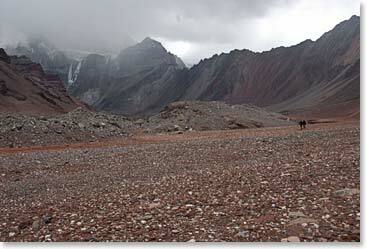 The great news is everyone has arrived to Base Camp at 4,200m (13,800ft). After a long day with challenging conditions the group is tired and ready to spend tomorrow resting at Plaza de Mulas and preparing to move high on Aconcagua. It was easy to get started this morning with clear skies and beautiful views of Aconcagua ahead. It wasn’t long until the clouds rolled in on us. 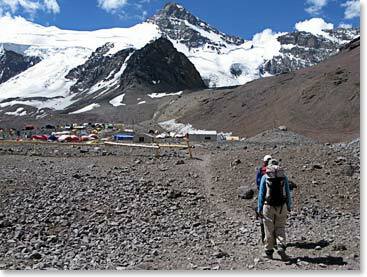 After a long, challenging day of hiking Plaza De Mulas Base Camp is a welcoming site!.